For 23 years we’ve been a bunch of beer geeks with a music program, and it’s safe to say that music has played a huge role in the creative and artistic direction of many of our off-centered ales. So it’s no surprise that our latest and greatest limited bottle release - The Best Ever Dark Munich Beer Out of Milton - was inspired by The Mountain Goats’ The Best Ever Death Metal Band Out of Denton! The Best Ever Dark Munich Beer Out Of Milton was brewed with heaps of German Munich malt, debittered and huskless Chilean black malt, and red rye crystal malt. Old-fashioned slow-roasted corn meal and deeply nutty Abruzzi rye were also added to the mix, resulting in a richly layered Munich Dunkel that’s full of toasty, well-rounded, smooth, earthy flavors. Releasing at our Milton Tasting Room & Kitchen on Saturday, Oct. 6 at 11 a.m., only 200 bottles of this malty and roasty autumnal lager will be available. 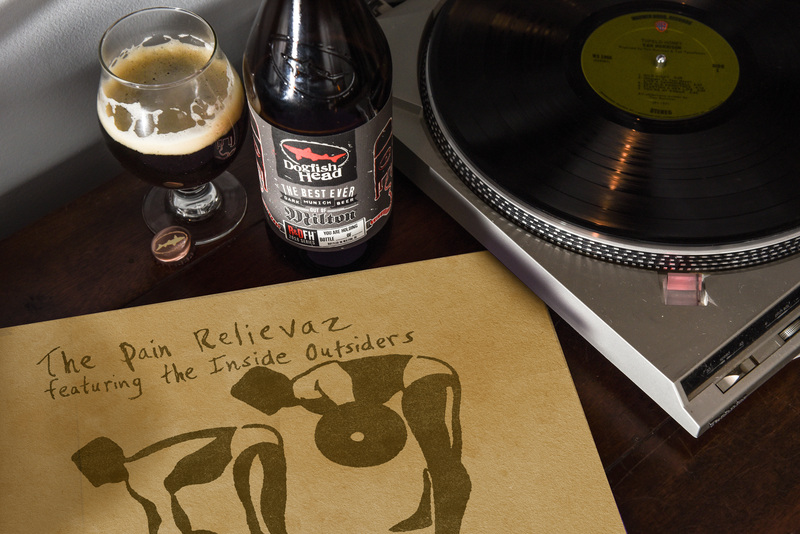 Priced at $20, each 750ml includes a double-sided, two-track vinyl from our very own beer-geek, tongue-in-cheek, hip-hop duo … the Pain Relievaz! The inspiration for this adventure came to Sam about a year ago as he was driving to work listening to The Best Ever Death Metal Band Out of Denton, and began riffing on the lyrics, and phonetically, the phrase ‘The Best Ever Dark Munich Beer Out of Milton’ fell right into place. With a production brewery located in Milton that cranks out both lagers and ales, he thought it would be fun to make a beer and musical track inspired by the song. Cue the Pain Relievaz. Sam reached out to his Pain Relievaz counterpart, award winning Great American Beer Festival lager brewer and Dogfish Brewing Ambassador Bryan Selders to lend a musically-talented hand with bringing this beer and music collaboration to life. The Best Ever Dark Munich Beer Out of Milton song is featured on a double-sided album and is only available on the limited vinyl. The album also includes ‘Boys & Girls of Summer,’ a Pain Relievaz original track, featuring longtime friend and collaborator, Juliana Barwick, which is currently available for purchase on iTunes. In addition to a limited bottle release and vinyl, we’ve created a love-letter music video of this off-centered homage featuring Sam, Bryan and Matt Silverman – Brewings & Eats Sous Chef, jamming on stage as they belt out beer-inspired lyrics in a video that pays tribute to the original Mountain Goats song … enjoy!